The iPhone 5S was Apple's first smartphone with the Touch ID fingerprint home button and a 64-bit processor when it launched in 2013. It was the most premium, most expensive iPhone you could get your hands on, but now it's a very different story. The current crop of Apple smartphones - iPhone 8, 8 Plus and iPhone X - couldn't be further from what the 4-inch iPhone 5S offered up, and while Apple no longer produces the 5S, there is still stock to be had in stores around the world - and at a low price too. If you're in the market for an iPhone that fits comfortably into the palm of your hand you either have to go for the slightly newer iPhone SE from 2016, or plump for the cheaper 5S. The iPhone 5S doesn't have the latest power, camera technology or Animoji, but it does run the latest iOS software ensuring it's still relevant and secure. When it was first unveiled, the iPhone 5S looked a lot like the iPhone 5, even though it went much further under the hood. We'd been there before with the iPhone 'S' conundrum: a new phone comes along, taking the shell of the previous model, adds some new bits and pieces, and then claims to be an entirely new phone. Which it was, of course. But also wasn't. Well, mostly was. It's the kind of move that only Apple can pull off with any kind of conviction: the notion that it can take the same chassis, have a little tinker, throw in a new CPU, slightly better battery and camera, and call it an all-conquering device. The 5S started out as an expensive smartphone, even on monthly plans, although thankfully the price has fallen considerably as the handset has gotten older. You can now find it in most places around the world for as little as $100 (£150, AU$150) at SIM-free prices, although these handsets may well be pre-owned, refurbished devices, rather than brand new handsets. 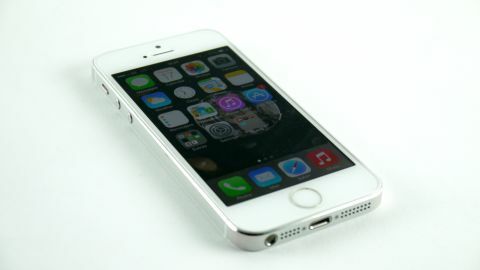 The iPhone 5S represented the pinnacle of that particular iPhone design for Apple, before it went thinner and more rounded with the iPhone 6; it was certainly very difficult to tell the 5S apart from its predecessor, the iPhone 5. Perhaps that's less of an issue now that the iPhone is becoming something of a commodity, a device that is so oft-used by the middle-aged generation that it no longer carries the lustre that the exclusivity of the earlier models emanated. That's not necessarily a bad thing either; just because it's not an 'exclusive' design that doesn't make the iPhone 5S any less premium. The danger is that it's starting to look a bit old-fashioned up against the handsets from 2014 and 2015. That said, it's still a stunning phone to hold in the hand, coming with the all-aluminium-and-glass chassis. There's no doubt Apple had a look at the way the iPhone 5 range (well, black and white) chipped so badly around the edges. But that same issue was apparent already in my iPhone sample within a week, so it looks like you're going to quickly need to stuff your new iPhone 5S in a case the second you release it from its box, lest you leave it in a pocket or bag with change and keys and it comes out looking like it's gone a few rounds with a randy cheese grater. The new colours, introduced with the 5S, which include champagne and space grey are a little odd, but at least promise to show up the scuffs a little less prominently. The way the iPhone 5S feels in the hand is something impressive though, coming with the low, low weight of 112g and dimensions of 123.8 x 58.6 x 7.6mm. It's still got that almost too-light feeling, that the premium metal finish is somehow diminished through the lack of heft, but it's a long way from feeling cheap. Compared to something like the Galaxy S5 or LG G3, the iPhone 5S is miles ahead when it comes to design, although less so than the HTC One M9 or One Mini 2 which have repeated the aluminium-clad trick. The Samsung Galaxy S6 and Galaxy S6 Edge demonstrate that Samsung has got its design mojo back, and both handsets give the iPhone 5S a run for its money in the looks department. It's got a slightly sharper edge than other models on the market, which can make it a little uncomfortable when being pressed to the ear. But I'm not going to quibble too much there lest it makes me seem a little wimpy. There were only a couple of real design differences compared to the iPhone 5, and one of them really is minuscule: the camera module is flanked by a dual-LED flash, which I'll talk more about later (it's a really rather nifty piece of technology, trust me). The other was a lot more substantial and impressive: the home button got a redesign which has been carried over to the newer handsets of today. Yes, it doesn't sound like much, but consider how iconic the Apple home button has been over the past half-decade, and you'll see why I'm holding the change in such high esteem. The visual effect is impressive, taking the square off the button and putting a fancy silver ring around the key. The effect isn't only aesthetic either, as this area serves as the Touch ID fingerprint scanner, now well established in Apple's iPhone range. It's good to know that even on this older handset you've got the benefits that Touch ID brings. Having bought two separate biometric security firms, Apple was likely to do something like this, but the implementation and visual effect is really something that Apple does well, and has done so here too. Beyond that, the iPhone 5S is identical to the 5, even down to the rattle in the power button. We're still a little confused as to why a device with such a high build quality has a slightly loose part with it, but shake the iPhone 5S gently and you'll feel the key moving around. It's not a big deal, but every so often you'll note the motion, and it does detract somewhat. Thankfully the rest of the phone is built impeccably. The round volume keys are easy to hit. the switch to enable volume on or off has the same sturdy feel that I've come to enjoy, and the headphone port is still welded to the bottom of the phone. The Lightning connection port is here as well, along with the stereo speakers on the bottom of the phone. I wish these were placed somewhere else, as when cupping the phone in landscape mode it's far too easy to cover these with palms or digits, and there's not really any way to shift around them. You can always use headphones, but that kind of negates the point of the speakers for gaming completely. The right hand side hasn't been left completely alone on the 5S, with Apple choosing this surface as the location for the SIM card tray – the iPhone 5S was one of the first handsets to rock the tiny nanoSIM technology. The iPhone 5 and 5S design was such a hit that you can still get a bunch of cases for the phone, including a variety of styles and shapes direct from the Apple Store on the web. But beyond that I'm still impressed with the design of the iPhone 5S. It's hard not to be, as if there's one thing that Apple gets totally right it's the way it assembles its devices. The metal and glass combination does feel a little fragile, and I'd recommend a case (perhaps a third-party option) to protect the aluminium, but the design is something that at least helps mitigate the higher price. Of course, good as the design is, it's now up against the iPhone 6S / iPhone 6 and iPhone 6S Plus / iPhone 6 Plus: sleeker, thinner, and rocking much larger screens. Whether or not these changes are for the better is up to you – you might be really attached to a phone screen that you can get your thumb comfortably across.